A suspected fraudster, who claimed to be a politician, has revealed, in detail, how he was able to defraud Senator Tayo Alasoadura, representing Ondo Central Senatorial District in the National Assembly of N3 million, while pretending to be a female relative. The 38-year-old suspect, Omoniyi Ademola, said it was easy to fool the senator, using software, which made his voice to become feminine. While posing as a female relative, Ademola created a WhatsApp platform and used a girl’s photograph as the Display Picture (DP). He added members, including Alasoadura. He started campaigning passionately for the senator. He was so passionate in his entreaties and campaign that Alasoadura was forced to put a call across to him. Since then, he had been defrauding the unsuspecting senator. But like most greedy folks, Ademola soon overplayed his hands, leading to police sniffing around him. He was arrested by operatives of the Inspector-General of Police Special Intelligence Response Team (IRT), led by a Deputy Commissioner of Police (DCP), Abba Kyari. 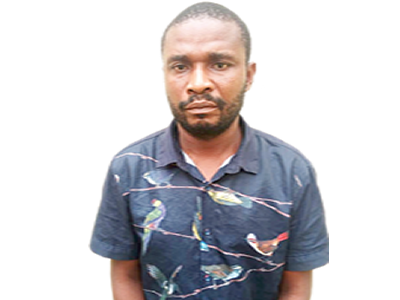 Ademola, a native of Ikare-Akoko area of Ondo State, started defrauding the senator in June 2016 during the Alasoadura’s campaign for the Ondo State governorship election. The suspect ran into hot water sometimes in September, after he attempted to defraud the senator of an additional sum of N5 million by pretending to have been kidnapped by some Fulani bandits operating on the Abuja-Kaduna Highway. He sent a text message to Alasoadura in Hausa Language asking him to pay N5 million as ransom or he (Ademola) would be killed. Alarmed, Alasoadura quickly alerted the Inspector General of Police, Ibrahim Idris, informing him about the kidnapping. The IG directed IRT operatives to investigate the matter. Ademola explained that the whole thing started in June 2016 when Alasoadura indicated his interest to contest for Ondo State governorship. He said: “I was one of the delegates during the governorship primary election, which was how I got his phone number. I then created a WhatsApp support group in his name. I started broadcasting news about him on the group and those of our party. “I set up the group with a different phone number and the picture of the young girl. Everyone in the group, including Senator Alasoadura, thought I was a woman. After several broadcast, Senator Alasoadura became really interested in me. He wanted to know who I was. I told him that I was Deborah, one of his relatives. I told him I was schooling at the University of Jos. Quite sure that he had confirmed that Ademola was saying the truth, Alasoadura sent money for the treatment of his supposed relative. When Alasoadura called after a long spell to ask how Ademola was doing, the suspect told him that his treatment was not improving his health. All efforts to get Senator Tayo Alasoadura, proved abortive as he did not reply to the text massege sent to his cell phone.